All Carpets clean all variety of Persian, Turkish & Oriental Rugs - as well as Chinese Rugs, Moroccan Rugs, Navajo Rugs, handmade rugs, shag rugs, natural dye rugs & more. Including all Material - Wool, Silk, Cotton, Sisal, Karastan, Tapestry, synthetic rugs & more. Rugs are typically manufactured different to carpet and often made with delicate materials such as wool, silk etc. which can sometimes result in colour run problems when treated incorrectly; for these reasons we always test rugs thoroughly before any work is carried out. 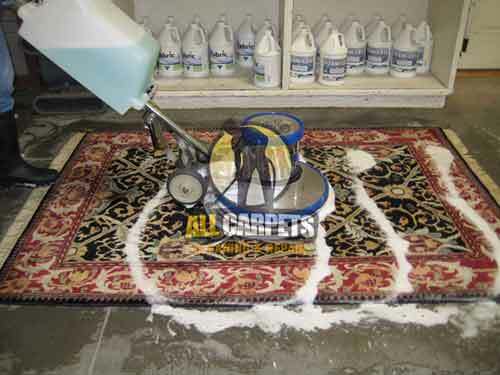 Trust your Rug Cleaning to the experts! Our experienced team knows everything there is to know about rugs and can thoroughly clean, repair and restore all rug varieties! 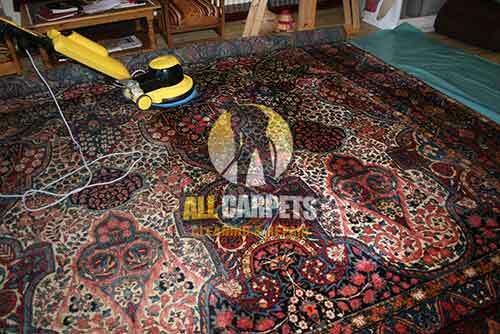 The All-Carpets team pride itself on its long and respected tradition of rug cleaning & repairs and are extremely knowledgeable in the various methods available for area rug cleaning. Our experienced technicians begin the cleaning process by identifying the fibres and dyes used in the creation of the rug to ensure the most appropriate cleaning method is applied. As with many beautiful creations, rugs will eventually perish following frequent use, however, by using the best available care you can ensure your rug stays in optimum condition for the longest possible time. Certain precautions must be taken when caring for oriental rugs. Whether you have a fine handwoven, antique Persian or a bright, modern rug, you will want your valued rug to be cleaned or repaired thoughtfully and carefully. Natural fibres such as wool, cotton and silk require very different care compared to nylon or polyblends. By using an incorrect cleaning technique permanent damage may occur. The natural fibres used in the creation of rugs are produced either by insects, animals or plants. The fibres produced by insects and animals are known as protein fibres while those produced by plants are known as vegetable or cellulosic fibres. Both these fibres types are highly absorbent and will require prolonged drying times following cleaning which can lead to shrinkage and the development of mould if not managed correctly. Pre-Inspection: We begin the process with a thorough examination. We check your rug for any signs of fatigue and wear such as damage, colour instability or faded areas. Once a full assessment has been performed we select the appropriate cleaning method. Dust Removal: It's always surprising how much dust we remove from rugs and carpets; dust that simply cannot be removed by using a vacuum cleaner or beating. 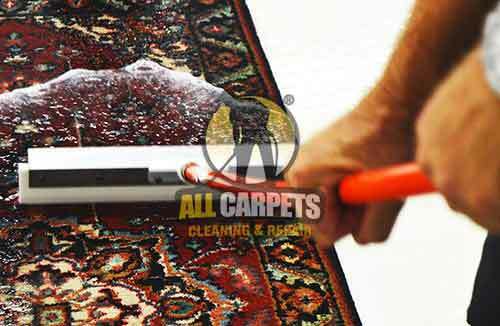 Dust becomes wedged within the knots and fibres of your rug or carpet which we remove using compressed air. Pre-Treatment: Blemishes found during our pre-inspection are appropriately treated. Certain marks or stains will need to be managed differently depending on their source and severity. Rinse: Rinsing the carpet or rug to ensure any soil and remaining cleaning residue is completely removed. This process also restores the natural feel of the material. Restore: Restoring the nap using specialist grooming tools. Dry: We dry rugs in a climate controlled environment. Drying time is less than 24 hours. Final Inspection: Our experienced team are proud to maintain the highest standards, meaning our inspection process is detailed. Any further steps necessary will be undertaken to ensure you the cleanest rug possible. AA beautiful rug can last a lifetime and perhaps even generations when maintained correctly. Although you will need to arrange for your rugs to be professionally washed and cleaned from time to time, you can always take extra care of your rugs with the following recommendations. Regular vacuuming is required to keep your rugs in perfect conditions; soil particle removal is essential as the abrasive edges of dust particles will have a damaging effect on the rug fibres.